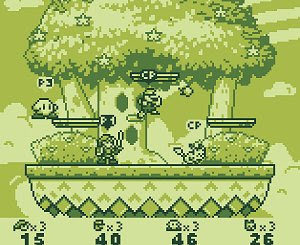 If Super Smash Bros. was adapted to the Gameboy, the resulting game would be something like Super Smash Land. Nintendo heroes such as Link, Kirby or Mario are some of the stars of this game, a freeware brawler of monochrome proportions (so to speak). Four human players may fight or the computer may control some of them in three different game modes. The best players will unlock the secret characters and complete the – sadly – small roster of the game.